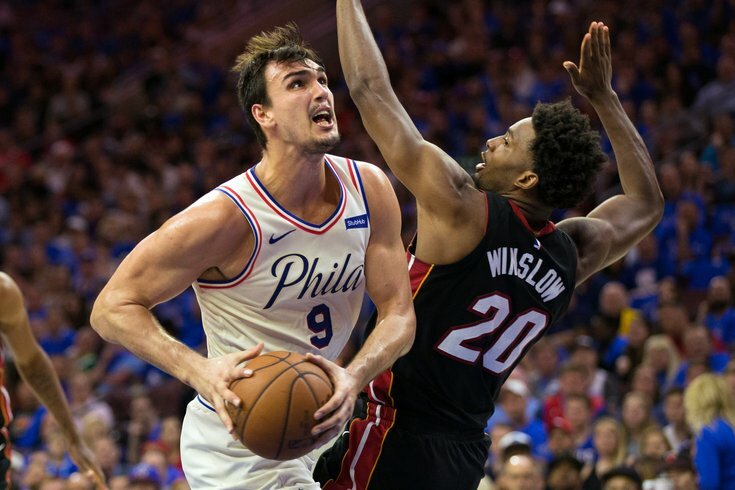 Philadelphia 76ers forward Dario Saric drives against Miami Heat forward Justise Winslow during the third quarter of Game 1. Saturday night's Sixers blowout over the Miami Heat may have felt like a definitive performance, but there is no such thing unless you're delivering one in a closeout game. Getting the first one on your home court is one thing, but it will ultimately mean nothing if the Sixers cough up their early series lead on Monday night. The game becomes doubly important for Miami with the knowledge that Joel Embiid's return draws ever closer, who can add an extra oomph to Philadelphia's frontline and another dimension to their team on both sides of the court. Philadelphia has relayed that Embiid passed the NBA's concussion protocol, and with another three days before the next game, he could very well hit the floor when the Sixers head out on the road later this week. If there was a time for Miami to steal a game in Philadelphia, it's now. The Sixers sound as though they're aware of this — the usually expressive and open Brett Brown talked to reporters before practice on Sunday, and he was cagey about what he thought the Heat might do to alter the course of the series. "I don't know," said Brown. "I think if anybody just looked at a stat sheet, you could probably make some accurate guesses." That's a bit of an oversimplification, but there was plenty to be learned from the matchup successes and failures in Saturday's blowout. Here's what you should expect when the Sixers take the floor at 8:00 p.m. Monday night. The first unexpected haymaker of the series came from the head coach with no playoff experience. Ersan Ilyasova's insertion into the starting mix in Saturday's second half was a brilliant adjustment, and the third-quarter blitz the Sixers went on was what ultimately won them the game. A lot of the failures on Miami's end came down to poor effort and defense from Hassan Whiteside, the aloof center who has been in Erik Spoelstra's doghouse as of late. Though he pulled Whiteside for the duration of the second half starting from the 7:54 mark of the third quarter, Spoelstra downplayed the adjustment after the game. "It's not about him. This series and this game are going to move quickly," said Spoelstra. "There are a lot of substitutions both ways and there is not a lot of time based on the flow and the matchups. It's not necessarily an indictment to his first four minutes but we all have to collectively be better on Monday." Stevie Wonder could have figured out how bad Whiteside's defense is without the use of a broadcast to listen to. So I would expect a shift in minutes starting Monday night, with Olynyk eating a lot of the big man minutes when Philadelphia decides to go small. Put it this way: Olynyk is not going to be the guy who solves Miami's problems on the defensive end of the floor. There is a degree to which four-out lineups around Simmons are unguardable, defenses left with a catch-22 schematically. Do you want to leave one of Philadelphia's prolific shooters uncovered on the wing, or potentially give Simmons a free lane toward the basket? The answer is neither. Where Olynyk will help the Heat is on offense, which will correspond to Miami having an easier job on defense. This is something Brown did acknowledge during his availability on Sunday, when he credited his team's second-half increase in tempo to locking down Miami. "In the second half we started to defend better, and when you do that you're obviously now dealing with more missed opportunities. I think that notion always favors pace," said Brown. "The defense, I think, triggered the pace more than the pace went to a higher level just because we tried harder. I don't see it like that, I think our defense was the instigator of that." The Sixers did not necessarily have to tear down the court and score in true transition opportunities against Miami, and a lot of their work came in what the team refers to as the "yellow zone," the first seven seconds of the shot clock after a defensive rebound or a steal. When the ball is crossing halfcourt with 20+ seconds to go, the Sixers often able to walk into threes before defenses get set. The expression, "The best defense is a good offense" exists for a reason, and it's especially true in basketball where you're responsible for both sides of the ball at all times. Neither of the players Brown wants to play at the five in this series seem to be well-equipped to handle Olynyk on the defensive end. Amir Johnson and Ilyasova are not the best at defending in space, and Olynyk's offensive skill package is diverse enough that he can hurt Philadelphia from the perimeter or by exposing a lack of foot speed covering roll men. If I were a betting man, I wouldn't place a ton of money on Olynyk shooting 69 percent from the field and 80 percent from three for the rest of the series. That said, he demands respect as a shooter and is crafty enough in the restricted area that he could help crack Philadelphia's defense. And unlike Whiteside, he's not going to check out of a game if he's not getting an extreme volume of touches. If you were just going off the matchup data provided by places like NBA.com, the splits for Simmons' assignments are fairly even. James Johnson was credited with 26 possessions worth of effort, Justise Winslow had 22, and Josh Richardson was a distant-ish third with 13 cracks at the Simmons challenge. All of them were fairly effective at stopping Simmons from getting his own baskets, but that sort of misses the point when it comes to Simmons. His elite talent is as a passer, so you're not necessarily drawing up matchups to stop him as you are attempting to cut off the connection between he and his teammates. Logically, it all seems to suggest Johnson should continue to take the Simmons assignment. He has been the best at forcing Simmons into turnovers, which is the quickest way to unravel things for Philadelphia. If you're not gaining any sort of advantage by playing the smaller guys on Simmons, it doesn't make sense to keep going back to that well. The lineup weirdness dictated by the presence of Simmons and Saric ensures that if you use one of your wings to guard Simmons, other guys are going to get cross-matched in ways that benefit the Sixers. One of your bigger players is going to have to track one of JJ Redick, Robert Covington, Saric, or Ilyasova out to (or around) the perimeter. When the Sixers are running action for guys like Redick, there's a built-in assumption that teams will either switch or at least help on the players they're trying to set free, setting off chain reactions in an opponent. Big men being asked to make quick reads and rotations toward the three-point line when their buddies are getting screened is a recipe for disaster. If you're going to drop back toward the paint anyway, why not take it a step further and put the players best equipped to chase guys around the perimeter in position to do so? Simmons isn't really wired to grab that opportunity and use it as an excuse to take over as a scorer. Yes, this is a story that is not going away anytime soon. Until Markelle Fultz begins regularly (and competently) attempting shots from deep, he is going to receive very little respect from Miami in this series. And this impacts players beyond the rookie guard, of course. During a sequence in the fourth quarter of Saturday's win, Dwyane Wade didn't even really bother trying to contest Fultz by the perimeter even though he was only a short pass away from the ball. Instead, he sat right around the free-throw line and ended a potential Redick drive to the basket before it ever got started. Philadelphia's backups have been clicking, and Fultz is acquitting himself well for a player missing an integral part of his game. But this problem is going to get worse before it gets better. Based on recent form and Fultz's importance to the long-term plans of the team, he deserves to take 100 percent of T.J. McConnell's minutes on merit. He's a dynamic creator with his dribble, and every once in a while he uncorks a series of moves that leaves you thirsting for more. It's just much, much harder for that to be appreciated when teams don't show you any respect from the perimeter. The Sixers did not draft him to be a miniature Ben Simmons who would tear up the floor in transition and make his money as a pass-first guard. Changes are coming in South Philadelphia on Monday night, but whether they work out in Miami's favor is another story entirely.